The paperwork you sign when booking your wedding location is a business agreement. 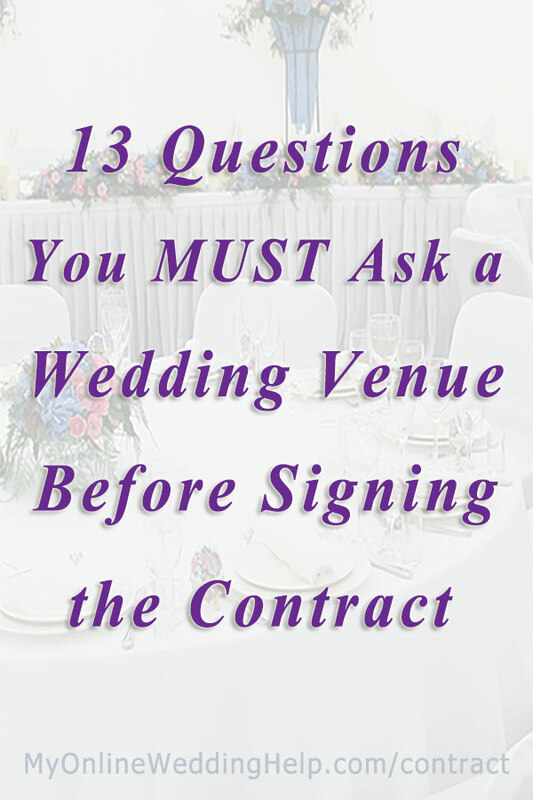 And having questions for those event venues before signing on the dotted line is a must! While the person you are working with is not likely to be deceptive, they are in business to make a profit. So, to avoid last minute surprises, you should confirm details and get them in writing. 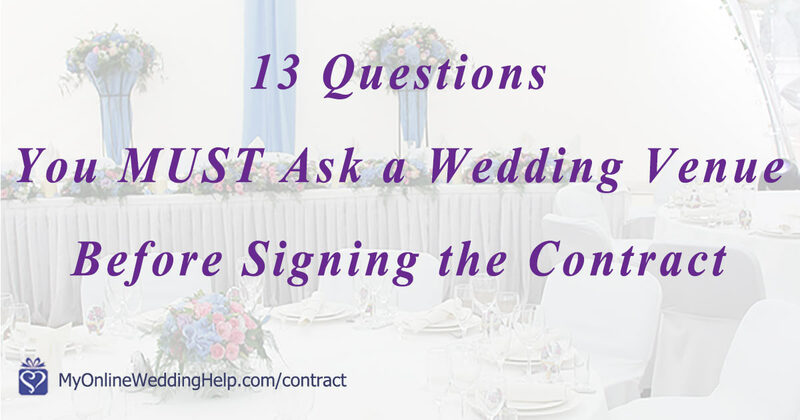 Here is a wedding-event vendor contract checklist of 13 questions to ask while vetting your venues. Here are a couple of definitions you should become familiar with. A venue is the location your wedding or reception will be held. Yours may be both at the same room or facility (when the place provides all-inclusive wedding services). Or you may choose to have them at separate places, in which case you will have two venues. An example of this is when you have a church wedding and rent a reception hall for the reception. These are the people and companies that do the work of planning and putting on your wedding. The venue is a vendor, as are the caterer, baker, photographer, wedding coordinator, florist, and others. The names and addresses of you and the venue. What, exactly, you have access to during your event. Your costs and dates deposits are due. Who provides vendors or what vendors are allowed. Licenses, if any, provided or needed. Their rules regarding alcohol, decorations, music or noise, time you must leave, and anything else the venue finds important. Legally binding signatures from both you and the venue manager. Now that you know the terminology, here are those tips for making sure you end up paying what you expected for your big day. 1) Is there an added charge for using my own vendors? Many times, locations have their own coordinators, caterers, or other professionals they want you to use for your event or included in the cost. It is critical for you to clarify the agreement not only so you know the final cost, but also so you understand which responsibilities fall on your shoulders. 2) Does the price include alcohol or is that extra? Some venues will charge based on actual wine, beer, and liquor used. If this is the case, the quoted fee will not include those items. 3) Can I bring in my own food, drink, and/or cake? Even if it is only a room rental, the facility may require you to use certain services they provide. If there are restrictions, discuss the cost of those services and if they are included in the price you’ve talked about. Likewise, if you are buying a package, find out if do-it-yourself is an option for food and beverage and how that affects what you pay. 4) If I do bring my own food, drink, or cake are there extra charges? The venue may see you supplying certain items as more costly for them. While it’s true they save on what you provide, their people may still be doing some of the work. For example, there may be a cutting and plating charge for an outside cake. In some cases there may be a sort of “privilege” fee beyond labor cost to make up for lost profit. Alcohol is a good example. The venue can make very good money on wine and liquor, so may add on substantially extra, commonly called a corkage fee, just to open containers. And no self-opening allowed! 5) Are rentals included in this price? Chairs, tables, tablecloths and other adornments may or may not be provided. 6) Are there set up fees? This could be especially important to make clear if you plan to have both your ceremony and reception at the same venue. 7) Do you do the breakdown and clean up or do I? This can substantially impact who and how much you pay. There may be a charge for guest and/or valet parking, so clarify the arrangement. If there is a charge are you or the guests paying it? 9) If there is an additional service charge does it cover all tips? Who you should tip can be confusing, so many times the venue will add on a percentage over the quoted price to use as tips for the servers, bartenders, and others. Explore exactly how that works. Does it cover everyone or do they feel it is customary to tip certain additional staff? 10) Is there a time limit and what’s the cost of going over? There is often a set amount of time you can utilize the reception space (four or six hours is common). The cost of going over on time can be substantial. 11) What are the tax rates and related fees? If you are charged per person for any piece of the reception, you will want to explicitly understand how they will arrive at the final number. Ask these additional questions to clarify. 12) Is there an additional cost for my other vendors (i.e. the photographer, videographer, planner, and DJ/band)? Your professionals will need to eat, so it is important to know if or how you need to count them. Should they be in the final headcount or reported separately (In other words, if you can get a discount rate for the vendors)? 13. Are there special considerations for children? Often, the child cost is less than the adult rate, so ask. You will also want to follow up with separate counts before the event and verify they’ve tallied the final bill correctly. See the Printable Wedding Planning Guide for more on how you start planning a wedding. Also does the venue require event insurance for the vendors that are participating at the event? Here’s one we learned the hard way: Is there a backup generator in case the power goes out? Yes, that one sounds very important, Audrey! I hope all worked out OK. It helped when you mentioned how you should consider if the venue you want to choose has tables and chairs you can use. I understand that doing some research can help you get the best place for your ceremony. My daughter is getting married, so I wanted to help her find the best place. Thanks for helping me understand that we must ask about the rates of the drinks since some venues will charge by the beverage which will not be included in the quote. I will share this tip with my sister to help them ask the right questions when they look for a venue since they are on a limited budget. They saved up for this for two years, so they don’t want to postpone it anymore that is why they are looking for those that can fit into their budget.